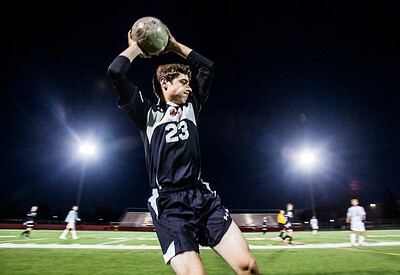 Kyle Grillot - kgrillot@shawmedia.com Libertyville junior Ryan Pacholski throws the ball in during the first half of the boys regional final match between Barrington and Libertyville Saturday, October 26, 2013. Barrington won the match 2-0. 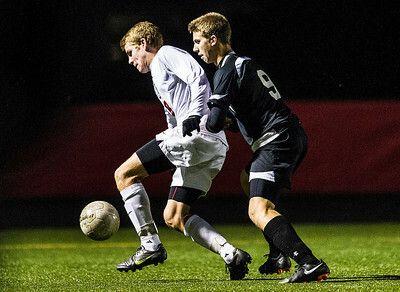 Kyle Grillot - kgrillot@shawmedia.com Barrington sophomore Sean Kim (right) passes the ball under the defense of Libertyville senior Llyod Chatfield (14) during the first half of the boys regional final match between Barrington and Libertyville Saturday, October 26, 2013. Barrington won the match 2-0. 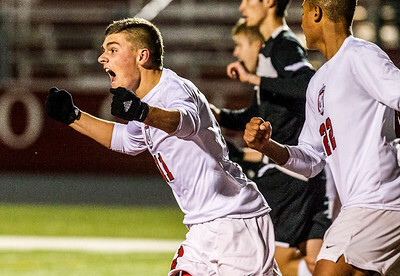 Kyle Grillot - kgrillot@shawmedia.com Barrington junior Shawn Owen (11) celebrates after scoring a goal in the first half of the boys regional final match between Barrington and Libertyville Saturday, October 26, 2013. Barrington won the match 2-0. 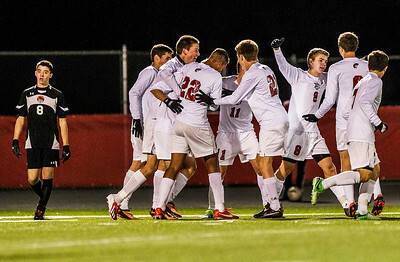 Kyle Grillot - kgrillot@shawmedia.com The Barrington team celebrates after a scored goal in the first half of the boys regional final match between Barrington and Libertyville Saturday, October 26, 2013. Barrington won the match 2-0. 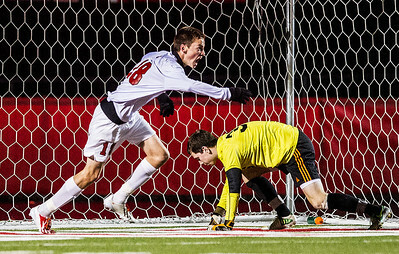 Kyle Grillot - kgrillot@shawmedia.com Barrington senior Jonathan Wilson celebrates after scoring a goal during the first half of the boys regional final match between Barrington and Libertyville Saturday, October 26, 2013. Barrington won the match 2-0. 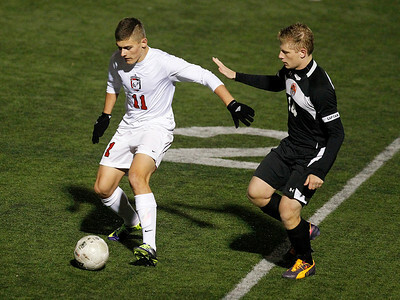 Kyle Grillot - kgrillot@shawmedia.com Barrington junior Shawn Owen (11) controls the ball under the defense of Libertyville senior Lloyd Chatfield during the second half of the boys regional final match between Barrington and Libertyville Saturday, October 26, 2013. Barrington won the match 2-0. Kyle Grillot - kgrillot@shawmedia.com Barrington senior David Conrad (8) controls the ball under the defense of Libertyville senior Kiki Savatic (9) during the first half of the boys regional final match between Barrington and Libertyville Saturday, October 26, 2013. Barrington won the match 2-0. 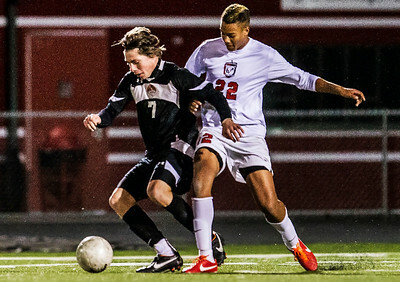 Kyle Grillot - kgrillot@shawmedia.com Libertyville senior Nick Vogel (7) controls the ball under the defense of Barrington junior Giles Phillips (22)during the first half of the boys regional final match between Barrington and Libertyville Saturday, October 26, 2013. Barrington won the match 2-0. 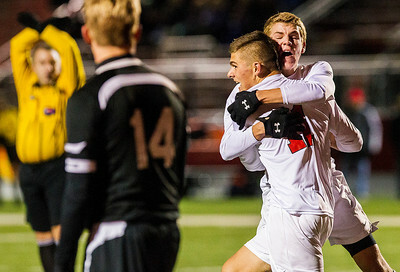 Kyle Grillot - kgrillot@shawmedia.com Barrington junior Shawn Owen (11) celebrates with senior David Conrad after scoring a goal in the first half of the boys regional final match between Barrington and Libertyville Saturday, October 26, 2013. Barrington won the match 2-0. 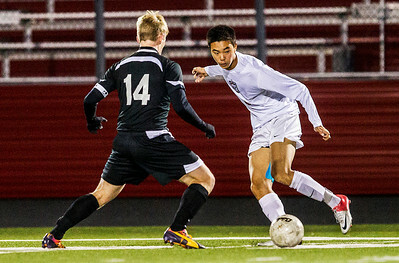 Barrington sophomore Sean Kim (right) passes the ball under the defense of Libertyville senior Llyod Chatfield (14) during the first half of the boys regional final match between Barrington and Libertyville Saturday, October 26, 2013. Barrington won the match 2-0.